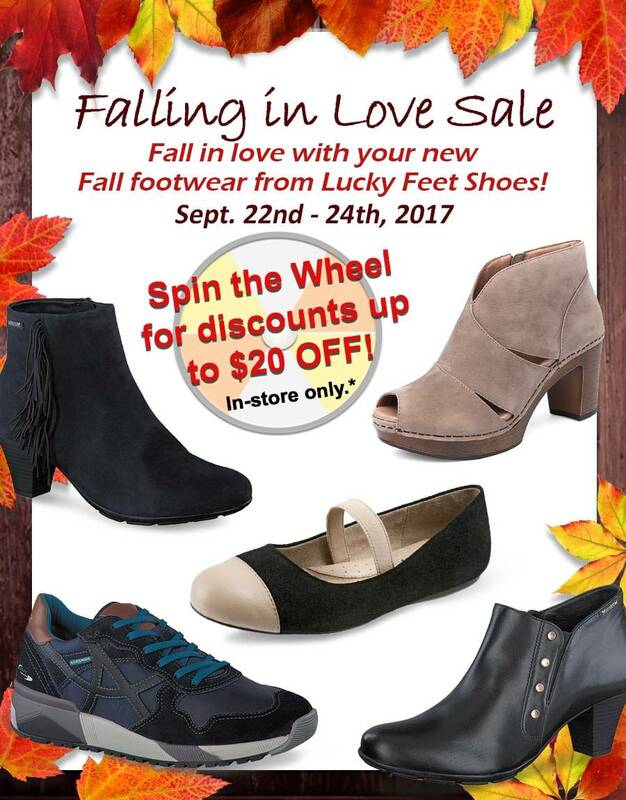 Fall in love with your new Fall footwear from Lucky Feet Shoes! Starting this Friday Fall in love with this Fall’s must-haves! Stop by and spin the Lucky Feet Shoes PRIZE WHEEL for your chance to score up to $20 off your purchase when you spend $74.95 or more! * Come see the New Fall Arrivals from the Brands You Love! Fall shoe sale starts this Friday 9/22 and runs through Monday 9/24. Find a store near you! *Offer only valid on shoe pairs purchased over $74.95. Valid only on the purchase of in-stock merchandise. Prize amount ranges between $5 to $20. Come into any one of our stores located in Costa Mesa, Anaheim Hills, Rancho Cucamonga, Riverside, San Dimas, Long Beach, Temecula, La Quinta and Palm Desert, today and shop our Comfort Footwear! At Lucky Feet Shoes, we carry many comfortable and stylish: sandals, heels, walking shoes, wide shoes, running shoes, casual sneakers, clogs, wedges, flats, booties, and boots. Come and visit us today! If you are looking for Comfortable Shoes in Orange County, the Inland Empire, Los Angeles County, Temecula or Riverside; we have nine stores to serve you!